There’s a big, wide world of micro-tipped pens out there, but when it comes to what’s available in physical American stores, choices are limited. 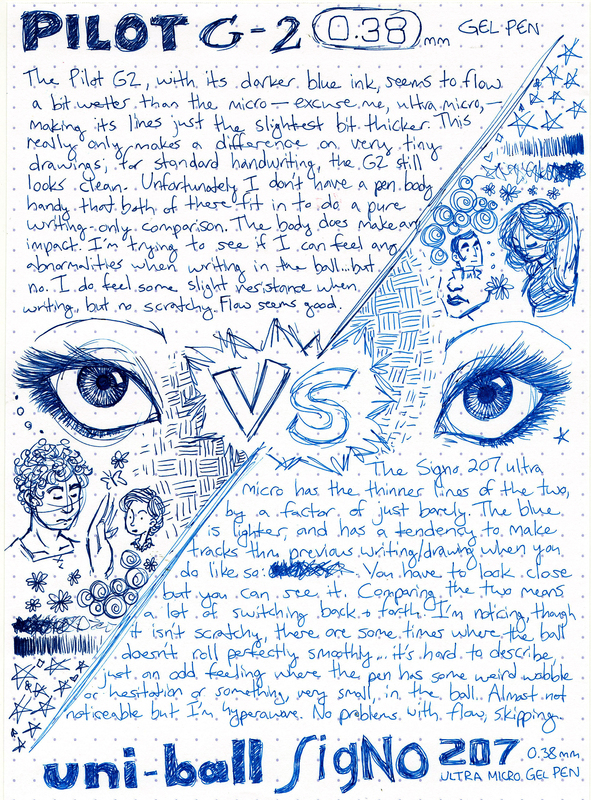 So it’s high time for a showdown between the two most commonly available retractable micro tip pens: the Pilot G2 0.38mm and the Uni-ball Signo 207 Ultra Micro (in blue). 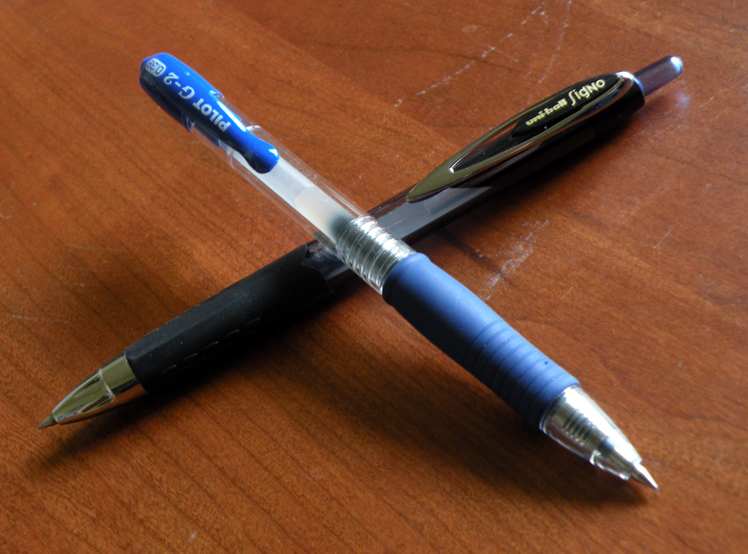 I’ve laid out my thoughts before on the design of both of these pens. Comparing the two is like trying to determine the winner in a noodle-armed slap fight. No one really wins, and we all feel a bit silly. Are these really both 0.38mm? They don’t look the same size. What it really comes down to here is writing. 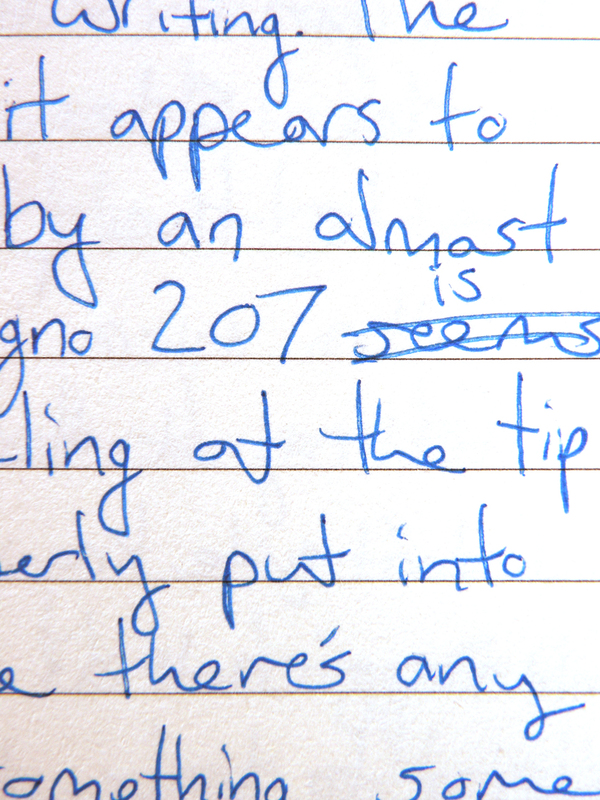 The Signo 207 has lighter ink, and it appears to write thinner than the Pilot G2 by an almost microscopic factor. But the Uni-ball Signo 207 is occasionally plagued by some odd feeling at the tip when writing, something I can’t properly put into words. It’s not scratchy, it’s not like there’s any problem with the flow of ink, but there’s something, some slight something, that is at times getting in the way of 100% smooth writing. And the Signo does a lot of this. See those near-railroads? The Pilot G2 isn’t exactly perfect either. It isn’t scratchy, but it feels ever so slightly slower when writing compared to the Uni-ball, like some kind of microresistance is involved—but the performance is more consistent, both in terms of the feel and the quality of the lines being laid down. The vertical line of my Ts with the Uni Signo 207 betrays an occasional tendency to deposit less ink in the middle than the sides of the line. 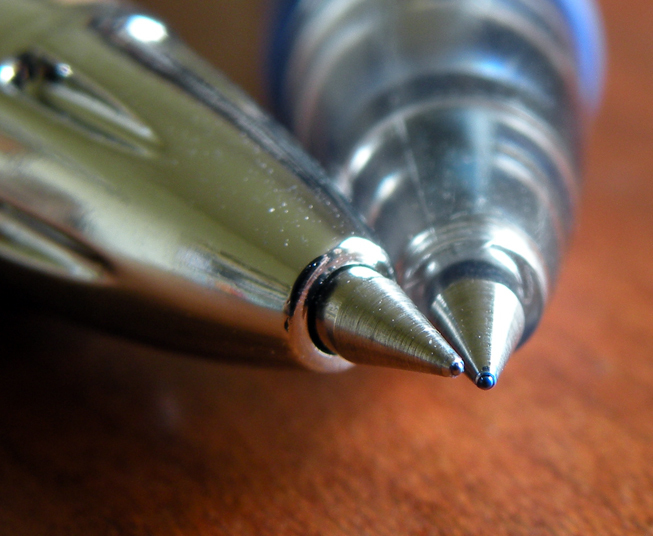 The Pilot G2 does it too, but less often. This has the makings of an excellent family crest. I’ll get the castle fixed up and have it printed up on some flags and armaments. If the Uni Signo 207 could get itself together and always write without that weird feeling to it, then in spite of its annoying grip it would be the clear winner. 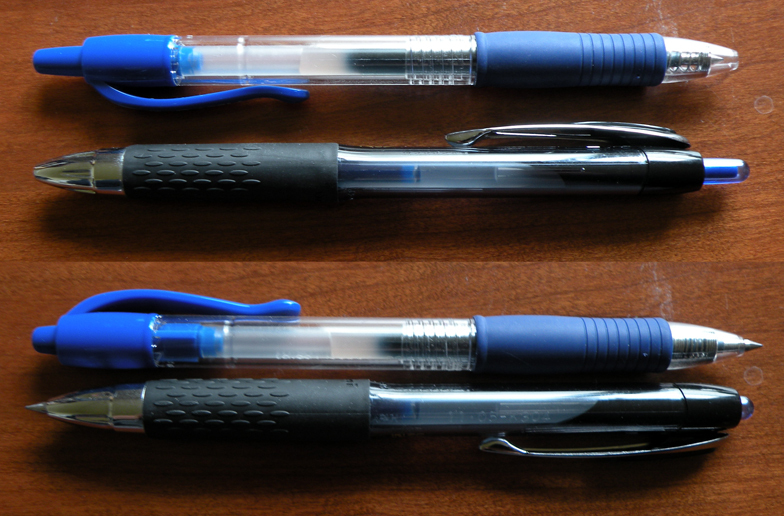 Both of the pens I’m using for this comparison I’ll admit are a few years old, brought back into use for this review, so even if age has brought the performance down it should have done so equally, because I got these pens around the same time. For its consistency in performance, I declare the Pilot G2 0.38mm the winner of this fight. Great review thanks! I didn’t realize the G2 came in a .38. I have 2 blues and a black that I’m using daily for making detailed notes in my Moleskine, my Gratitude book, writing receipts, writing cheques, well, writing everything. I’m loving it.The ink flows very smoothly, no skipping, with just the right amount of drag (I don’t like a pen that is too fast). The colours are solid and vibrant and the line is thin and uniform. In other words, I think you should review it! P.S. Mine say “Made in Germany” and Germany on the barrel, so I think that means “not made in China”. to say that this write-up very pressured me to take a look at and do it!